We offer custom testing service measurements for the quantification of biomarkers in biological samples. Our experienced laboratory staff perform all sample measurements, allowing customers to fully rely on the data without having to invest in additional time for the quantification of biomarkers or expensive laboratory equipment. Using proprietary Biomedica ELISAs, biomarkers can be measured in serum, plasma, urine and cell culture supernatant. For more information on our product lines, see our product list. If you want to measure an analyte, which is not in our own portfolio, we offer service measurements using ELISAs from a variety of manufacturers. Luminex xMAP® (multiple analyte profiling) technology-based immunoassays enable the simultaneous detection and quantification of multiple analytes. We offer a broad range of high quality RNA services including RNA extraction, NGS and RT-qPCR and the custom analysis of microRNA signatures. A complementary technology to mass spectrometry for the simplified analysis of complex glycans on cell surfaces of living cells or in cell homogenates. In a first step, the customer outlines the requirements, technical specifications and scope of the study. Based on this, the service manager makes a quotation and defines a timeline for the completion of the service measurements. Once the schedule is agreed upon and the contract is signed, the customer sends the samples to the Biomedica laboratory, where they are stored at -80ºC until the time of the measurement. All samples are transported on dry ice and shipment temperatures are monitored throughout the transport. Upon delivery, the customer will receive a confirmation of the receipt of the samples from Biomedica. Next, experienced laboratory staff perform the agreed upon assay protocol and measure the quantity of the relevant biomarkers in the samples. All samples are measured in duplicate. Standards and controls are included in all assays. If more than one kit is required, all measurements are taken using kits from a single lot. Samples are identified based on sample numbers, allowing the patient data to remain completely confidential and anonymous. The experiment results in the recording of raw data. In a final step, the laboratory staff process the raw data read-out and compile it into a final report that includes an easy-to-interpret summary of the results. This report is then passed on to the customer. Service measurements are generally available for serum, plasma, cell culture supernatant and, in some cases, urine, saliva and CSF samples. Available sample types will depend on the kit used for the measurement. We offer our ELISA testing services for €200 per ELISA or Luminex assay. This price includes sample handling, preparation and measurement, raw data generation, as well as the compilation of the data into a final report. Please note that this charge does not cover the price of the kit itself, which will be added to the testing service charge, or shipment costs for samples. Supplementary validations can be accommodated according to customer requirements and specifications at an additional charge. 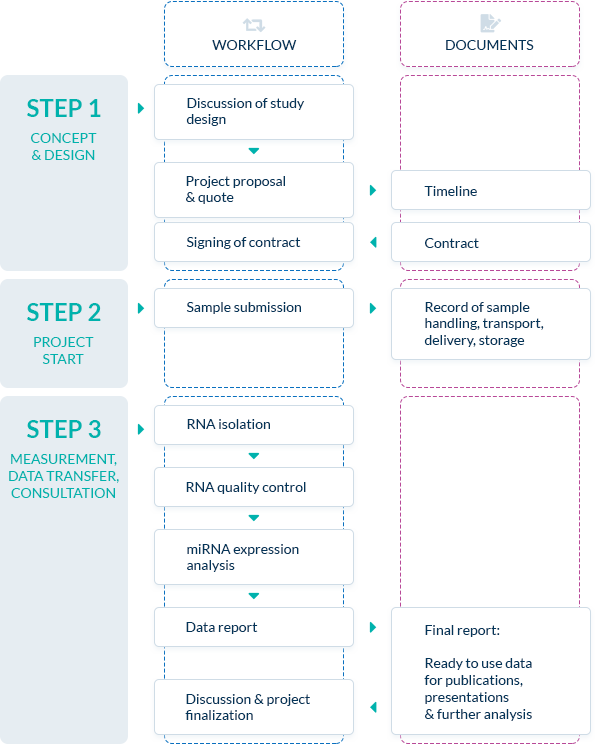 Biomedica offers microRNA services in cooperation with TAmiRNA. In a first step, the customer outlines the requirements, the objective and scope of the study. 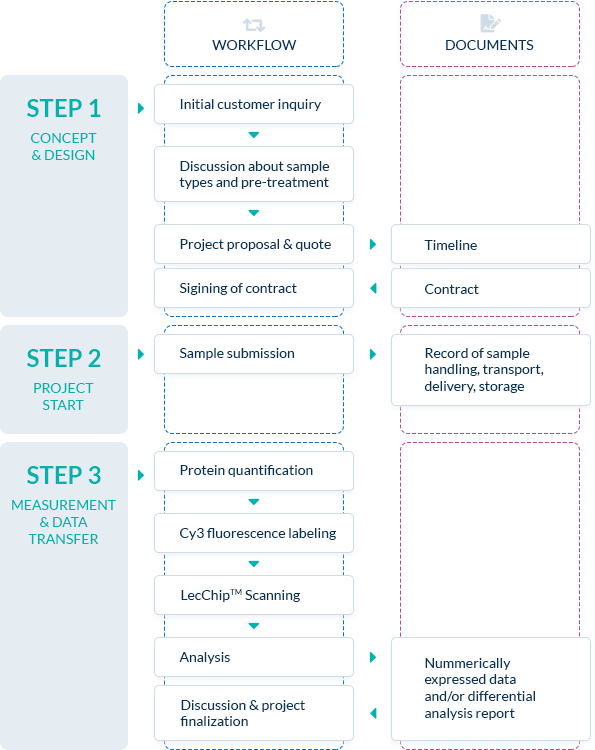 Based on this, the service manager makes a project proposal and quotation, and defines a timeline for the completion of the service measurements. Once the schedule is agreed upon and the contract is signed, the customer sends the samples, where they are stored at -80ºC until the time of the measurement. All samples are transported on dry ice and shipment temperatures are monitored throughout the transport. Upon delivery, the customer will receive a confirmation of the receipt of the samples. Next, experienced laboratory staff extract the RNA from the samples. After a quality control step, they perform the service of interest and measure the quantity of the relevant microRNAs in the samples. The experiment results in the recording of raw data. In a final step, the laboratory staff process the raw data read-out and perform an in-depth analysis, which is compiled into a final report that includes data ready-to-use for publications and presentations as well as for further analysis. This report is then passed on to the customer and discussed in a one-on-one consultation. Prices depend on the exact specifications of the study, the type of analysis and the number of samples. Please get in touch to receive a quote. Biomedica offers Glycan Profiling services in cooperation with VelaLabs GmbH. After an initial customer inquiry, the objective of the analysis and the scope of the study is established. The GlycoStationTM Reader can analyse a wide variety of samples including cultivated cells, biopsy tissue sections, paraffin fixed tissue sections, serum, urine, cell culture supernatants and milk. Based on this, the service manager makes a quotation and defines a timeline for the completion of the service measurements. 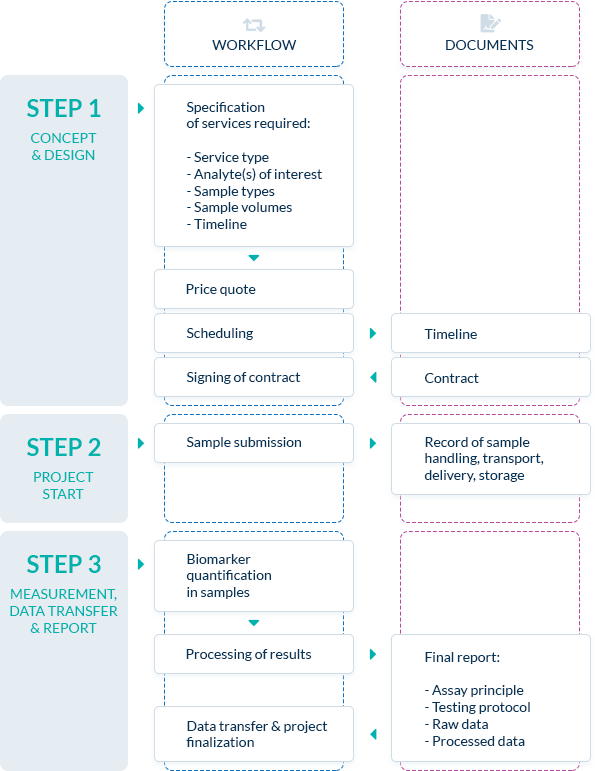 Once the schedule is agreed upon and the contract is signed, the customer sends the samples to Biomedica’s service partner, where they are stored accordingly until the time of the measurement. Upon delivery, the customer will receive a confirmation of the receipt of the samples from Biomedica. In the next step, the protein concentration of each sample is measured. Samples are then diluted to 50µg/ml and labelled with Cy3 mono-reactive dye. After labelling, the samples are further diluted, applied to and incubated on the LecChipTM. In the final step of the experiment, the LecChipTM is scanned and the fluorescent image digitalized. In a final step, the laboratory staff process the raw data read-out and compile it into an excel file. A more detailed report can be compiled on request, which contains a differential analysis and an explanation of the structural differences of the glycans between samples. This report is then passed on to the customer. Service measurements are available for a wide variety of samples including cultivated cells, biopsy tissue sections, paraffin fixed tissue sections, serum, urine, cell culture supernatants and milk. LecChipTM uses 45 different lectins, which specifically recognize different glycan structures. By analysing the lectin’s binding patterns, different structural glycan features can be identified. For an additional charge, customers can also obtain a differential analysis report, which contains a differential analysis (clustering analysis, ROC analysis) and an explanation of the structural differences of the glycans between samples. Prices depend on the exact specifications of the study, the number of samples and whether an analysis report is required. Please get in touch to receive a quote.